Serving as a reminder of a prehistoric time, sea turtles have remained largely unchanged for 110 million years. The sea turtles’ calm and wise demeanor has often been the muse to many a poet, painter, sculptor and songwriter. With an uncertain future, it is now more important than ever to conserve and nurture this sacred animal. North Island is an important nesting site for both the Hawksbill and Green turtle. With both species being legally protected in Seychelles and the Hawksbill turtle considered to be critically endangered, the North Island Conservation team has made it their priority to monitor their nesting frequency and through this process, recorded vast improvements in the number of emergences on the island. An ‘emergence’ is recorded when a female turtle comes ashore to make a nesting attempt. The number of individual turtles involved is likely to be much fewer, as each female lays between three and five clutches of eggs in a season, and may also make unsuccessful emergences where no eggs are laid. Encouraging results are reported by the Conservation Team with a 130%+ increase of the critically endangered Hawksbill turtle emergences on the island since 2014, as well as a 400%+ increase of Green turtle emergences, showcasing the islands ongoing contribution to the conservation of these species. 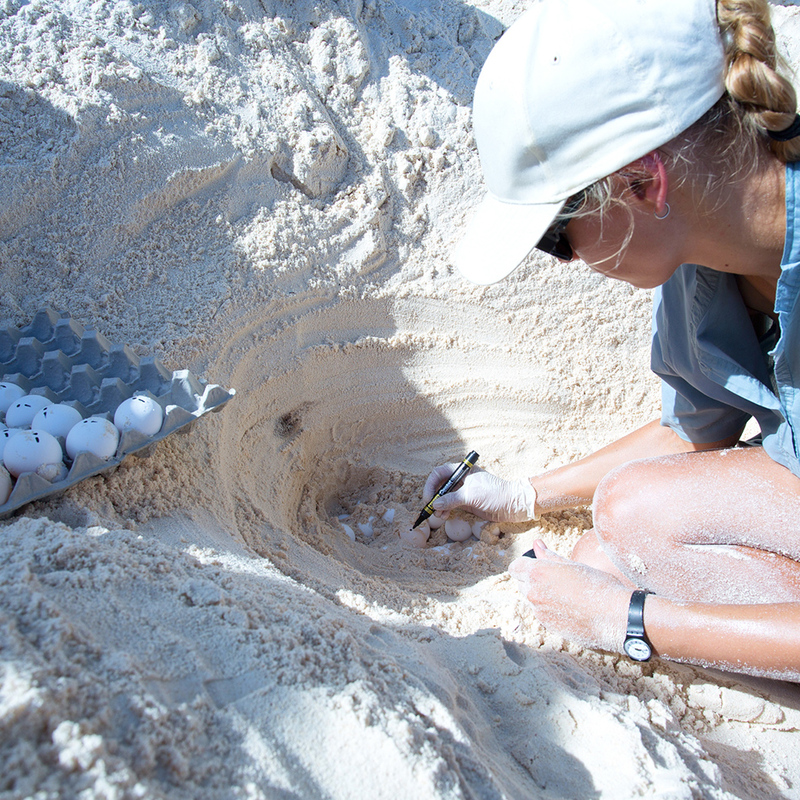 “We are seeing a long-term trend of increased nesting activity by both species on North Island and in Seychelles as a whole, which reflects the many decades of conservation taking place in the region. The nesting females are able to return to the beaches as the turtles are now being protected and not harvested for food or their shells”, said North Island Conservation Manager, Tarryn Retief. Restoring and maintaining a pristine beach ecosystem on North Island is just one element in the conservation of these ancient species. Even after making the hazardous journey down the beach to the waters of the Indian Ocean, the turtle hatchlings face many dangers before they mature and can breed. For the males, this brief dash across the sand will be the only time in their lives that they are ever ashore, while the females which survive will eventually return to nest on the very same beaches they hatched on – some 20 to 40 years later. Adult turtles and hatchlings alike must contend with abandoned fishing nets and other human debris when at sea, which adds further impetus to North Island’s commitment to ensure the turtles it protects are tagged and recorded for ongoing conservation research and assistance.